After a month of preparation, the series of events finally commenced with the teaching on Sutra of the Wheel of Dharma and The Rice Seedling Sutra by His Holiness the Dalai Lama from January 5, 2018, at Bodhgaya, renowned as the land of Buddha’s enlightenment. This series of teachings was organized and sponsored by the Dalai Lama Trust, Namgyal Monastery, Nalanda Shiksha, Mongolian Buddhists and few other groups. The first three-day teaching was particularly intended for the Indian Buddhist followers at the reques t of Nalanda Shiksha group and around 2000 Indians including college students from Delhi, Chandigarh and Jammu, people from Buddhist communities in Sankisa, local students from Bodhgaya and other people from few Indian states attended it. The three-day teaching was directly translated into Hindi by a competent translator in order to make them understand the whole teaching of His Holiness. The Trust also provided free lunch particularly to the Indian devotees by hiring catering services at a specific location with tents and dining tables installed. This series of teaching events later extended to a period of eleven days with some additional teachings, initiations, long-life offering, and other public functions. In order to cover all these programs successfully and effectively, a high-quality FM system was ordered and installed for the simultaneous translation of the teaching broadcast in English, Russian, Mongolian, Indonesian, Hindi, Chinese, French, Spanish, Korean, Vietnamese and Japanese for 3000 foreigners hailing from 70 different countries. It was also broadcast in Amdo and Khampa dialects for newly arrived Tibetans from Tibet. 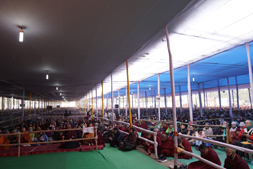 A number of Large Screens and HD quality TVs had also been installed at different angles in the teaching venue so that all the attendees can have a comprehensive access to the teaching of His Holiness the Dalai Lama. For those who could not attend the teaching, the whole program was broadcast live through social network sites like Facebook and official website of Office of His Holiness the Dalai Lama by our Audio & Visual team. On account of the length of the teaching and number of attendees, hundreds of temporary toilets, and urinal points were installed around the teaching venue for their convenience. 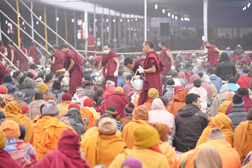 More than 50,000 attendees from across the world joined this series of events to receive the precious teaching conferred by His Holiness at the holy place of Bodhgaya. All the printing, laminating, and material cost of identity badges for entourage members and devotees as well as printing cost of teaching books were funded by the Trust. CCTV cameras and equipments were also hired for the purpose of safety and security measures as per order of the Gaya District Magistrate during His Holiness the Dalai Lama’s visit at Bodhgaya. This eleven-day teaching program at Bodhgaya was one of the many activities which was organized by the Trust and funded by it at the same time. The main reason for organizing such teachings was to present and promote concepts of basic human values including love, compassion, and warm-heartedness among all the sentient beings, in general, and human beings, in particular. These values are always considered universal in nature and basic conditions for happy life. 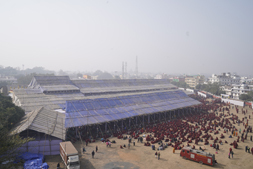 The series of Bodhgaya teaching events was concluded with the Diamond Cutter Sutra explained by His Holiness the Dalai Lama to thousands of followers on January 23, 2018, which was then followed by the representative of 2018 Bodhgaya Teaching Organizing Committee, presenting the financial statement to clarify what had been received in terms of donations and sponsorships, and what had been spent. He concluded his remarks by acknowledging the assistance rendered by the Gaya Administration, Bodhgaya Temple Management Committee and many others for making the events completed with success.